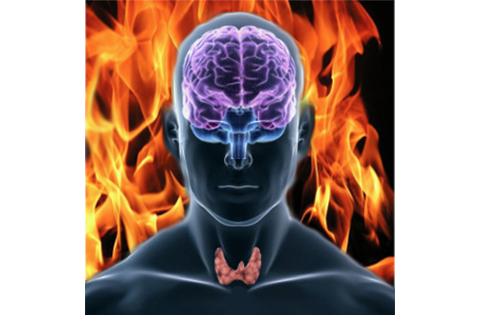 Thyroid hormone is a key iodinated molecule that accelerates energy utilization and oxygen consumption. A steady supply of thyroid hormone to all cells is critical for maintaining a normal physiological balance in a wide range of bodily systems, including metabolic, cognitive, nervous and cardiovascular systems. However, new evidence has emerged that in some cases the body might benefit from turning off thyroid hormone signaling as a way to protect against injuries. Cerebrovascular stroke is one such condition. During a stroke the blood supply to certain areas of the brain is suddenly interrupted, decreasing vital oxygen supply to neurons (brain cells) either due to a blood clot or bleeding from the vessels supplying these neurons. If prolonged, this interruption in oxygen supply results in neuronal cell damage or death and the associated neurological manifestations such as paralysis or impairment of sensorial functions. Treatment of stroke is aimed at dissolving the blood clot or stopping the bleeding, in as timely a manner as possible, in order to restore oxygen supply to the tissues and minimize cell damage or death. In addition, our cells help as well by slowing down metabolism and decreasing oxygen demands, thus minimizing the damage that will be inflicted by the limited supply of oxygen reaching affected tissues. As an example, cells shift their metabolism and burn predominantly sugar, which provides energy and utilizes less oxygen. New evidence indicates that protection during hypoxia is also achieved through the type 3 deiodinase, or D3 for short, an enzyme that inactivates thyroid hormone in the brain. Studies have found that in the hours that follow a stroke the brain shuts down thyroid hormone signaling by producing greater amounts of D3, which slows down the metabolic rate and decreases oxygen demands until normal neuronal blood supply is restored. These observations were made in neurons grown in the laboratory as well as in rats that suffered complete obstruction of one of the carotid arteries, unfortunately a condition commonly found in so many elderly individuals. Thyroid hormone signaling in the brain is different from the rest of the body. In the brain, the majority of the active thyroid hormone (aka T3) is produced locally via the activating deiodinase, D2, normally present in the glial cells. These are important cells that provide support for the function of the neurons. Using \specific membrane transporters, T3 molecules exit the glial cells and enter the neighboring neurons, which normally contain low levels of D3. During hypoxia D3 increases and inactivates incoming molecules of T3, depleting the cells from the biologically active thyroid hormone. This terminates thyroid hormone-driven metabolic events. Brain studies have found that damage caused by carotid obstruction is greatly reduced in systemically hypothyroid rats. D3 is a selenoprotein that is genetically induced by Hypoxia-Inducible Factor type 1 (HIF-1), a factor that is rapidly degraded under normal oxygen conditions but that accumulates in response to hypoxia. In the rat study, obstruction of the carotid artery led to the accumulation of HIF-1 and increased D3 in all areas of the brain that suffered ischemia, including the cerebral cortex and the hippocampus. In addition, D3 that is normally present in the cell membrane and in neurosecretory vesicles was redirected to the cell nucleus, which contains the thyroid hormone receptors. D3-mediate thyroid hormone inactivation physically closer to thyroid hormone receptors constitutes an advantageous mechanism to dampen thyroid hormone signaling and reduce metabolic demands for oxygen. It is fascinating how local control of thyroid hormone effects through the action of the deiodinases can play such critical roles in health and disease. Increasing the expression of D3 and dampening thyroid hormone signaling in the brain constitutes a protective mechanism that may limit/reduce damage caused by a brain stroke. Given that ischemia and hypoxia are common denominators of a large number of pathological conditions, it would be interesting to find out if similar protective mechanisms also take place in other important organs that express D3 during illness such as liver, lungs and heart.